Mae Nam is known for its long, white sand beach that stretches out over seven kilometres along the northern coasts of Samui. Coconut trees fringe the shores, and turquoise waters lap up playfully to the beach. The vibes are here relaxed, making Mae Nam a great bet for vacationers looking to escape the bustling crowds of the island’s more popular towns. 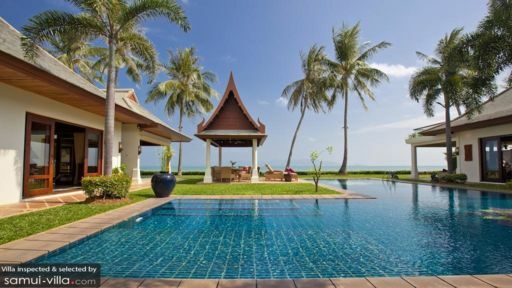 Your Mae Nam villa looks out to gorgeous tropical foliage, Samui’s rugged coastlines and the ocean. Seafront villas enjoy direct beach access - so you’re literally steps away from the beach. 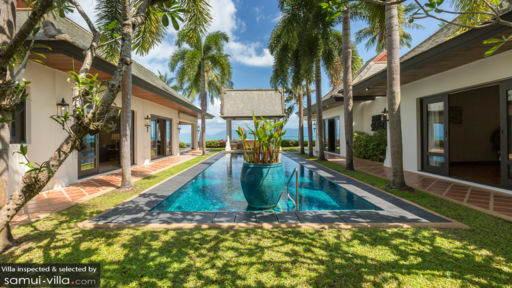 Each vacation rental is a perfect blend of traditional and contemporary, featuring Thai-style roofs and architecture alongside modern furnishings. And like all luxury properties, impeccable service and a full range of modern amenities are essentials at your villa. 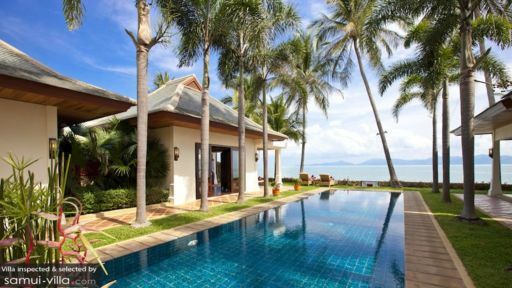 With its laid back atmosphere and calm waters, Mae Nam Beach offers a family-friendly setting for villa vacationers with young children. On Thursday evenings, stop by Mae Nam walking street (15 minutes’ walk from the beach) to soak up its bustling atmosphere. You’ll find myriad stalls selling a variety of souvenirs and knick knacks, street food vendors and mobile cocktail bars. Outdoor lovers will enjoy sweating it out over a game of frisbee golf at Samui Disc Golf. Looking to try out kitesurfing? Mae Nam offers excellent conditions for a great surf from November till March, and there’s a kitesurfing centre in Mae Nam Town with equipment for rental and kitesurfing lessons. Peppered all around town are amenities to meet a variety of needs and interests: drop-in yoga classes are held at The Yogarden Samui, Belmond Napasai offers a great spa experience and Island Organics lets foodies try their hand at whipping up Thai dishes - under the guidance of an expert chef. Your villa manager will readily assist with all your holiday needs, so getting out and about will be a breeze! Wonderful dining options abound in town. There’s Kobori Japanese Restaurant, La Bonne Franquette, Farmer Restaurant and Bar, The Boudoir, Mathis Café and Zenzibar Beach Bar. Unwinding slowly into the night after dinner is the way of life in Mae Nam’s mellow nightlife scene. We like the breezy vibes at John’s Garden and the seafront Nature Bar, but for a different feel there’s Taksin Lounge, a sophisticated venue with live music. Cultural sightseeing is part and parcel of most Samui vacationers’ itinerary, with iconic attractions like Big Buddha (nine minutes’ drive), Khao Chedi (an hour’s drive away) and Laem Sor Pagoda (an hour’s drive away) dotted around the island. Or venture offshore to picture-perfect Ko Tao, an island known for exceptional freediving and scuba diving. Ferry boats depart from Mae Nam Pier (eight minutes’ drive away), and the journey to Ko Tao lasts about an hour and 45 minutes.